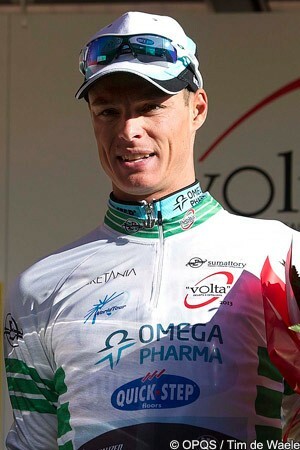 Gianni Meersman (Omega Pharma-Quick Step) continued his perfect start to the 2013 Volta a Catalunya as he sprinted to victory in the second stage between Girona and Banyoles. The Belgian, dressed in the race leader’s white and green jersey thanks to his stage one win, outsprinted Italian Daniele Ratto (Cannondale) on the gently rising finishing straight, with Australian Brett Lancaster (Orica-GreenEdge) taking third just behind them. The 160.7km stage saw a breakaway from Olivier Kaisen (Lotto-Belisol), Christophe Laborie (Sojasun) and Christian Meier (Orica-GreenEdge), who escaped in the very first kilometre. The three-man group was never allowed to get much more than three minutes clear on the rolling course, however, and was caught with just over two laps of the 9.2km finishing circuit remaining. From that point on the strong teams kept control of the peloton; the sprint for the line was marred slightly by a crash, but Meersman and Ratto were ahead of the incident and battling for the victory. "Even today it was a great sprint," Meersman said afterwards. "It was a great day for the team. “At the beginning we expected not a lot of support from other teams, which is quite normal,” he explained. “But, just as it was yesterday, the team was really strong. We managed to control the race. “The final circuit was nervous, but we were always on the front controlling,” Meersman continued. “Then, I have to say the team did a great job in the last two kilometres. Dries did a great thing closing the gap on two Blanco riders off the front, and then Andy Fenn led me to the 200 metre point. It was perfect, so I came out from the bunch and I did my sprint and I won, so I am glad I was able to win again for me and the team. A ten-second bonus on the line for Meersman meant that the Belgian extended his lead to 14 seconds over the previous day’s second place Valerio Agnoli (Astana), with Alejandro Valverde (Movistar) still third at 16 seconds. “This team, everyone knows their job and it's marvellous and super to ride with each and every one,” Meersman said, having joined Omega Pharma-Quick Step in a surprise transfer at the end of 2012. “Even for me personally it was a great moment in my career; it's the first time I've won two races in a row. It's really a special feeling after all the sacrifices I have done in my career. I am happy also for my family. I haven't seen them often because of the races, but I am sure they will enjoy with me this moment. “About the stage of tomorrow, we will go into the mountains,” he added. “So it will be my turn to help and work for my teammates and try to give them back all the help they gave me for these two first stages." Many riders were riding on their home roads as stage two rolled out of Girona, with several English-speaking members of the peloton choosing to base themselves in the city. Kaisen, Laborie and Meier escaped in the very first kilometre of the stage, and were quickly able to open up a three-minute lead. This was as far as Meersman’s Omega Pharma-Quick Step team was going to allow them to get, however, and, by the time they reached the seaside resort of Tossa del Mar after 29km, they had been pegged back to 2’30”. Not wanting to pull back the trio too quickly though, the peloton allowed it to dangle between two and a half and three minutes ahead as it crossed the 3rd category Mirador de Sant Feliu along the Costa Brava, then headed back inland towards the finish. Across the finish line to start the first of the four laps, with 36.8km to go, Kaisen, Laborie and Meier were still 1’40” clear, but this was slashed to less than 30 seconds by the time they were halfway around the second circuit. Before they could reach the finish line with two laps to go, the three riders were caught. There were several attacks on the final two circuits, but the Blanco team was keeping everything under control. A four-man group, which included Marcus Burghardt (BMC Racing) and Michal Kwiatkowski (Omega Pharma-Quick Step) managed to get a few seconds clear with less than four kilometres left, but all riders were back into the fold at the two kilometre point. Into the slightly uphill finishing straight Omega Pharma-Quick Step moved forward and, as British sprinter Andy Fenn sprinted up the left side of the road, Meersman went right and, although he met a stiff challenge from Ratto in the dash for the line, managed to hold on to take his second stage.